Women with a Slavic appearance rarely have black eyes; often a dark iris "comes" with the Eastern or African-American appearance. In this case, makeup depends not so much on the eye color, but on the type of person and skin type. Black-eyed beauties have a big advantage—a tasteless look can be achieved if their makeup is made in the right way. How to make a beautiful makeup for Black Eyes? First of all, one main and unconditional restriction: mascara in the makeup for black eyes should be of only one color—black. But, you can fully use it. Choose mascara with double action, which increases the length and the volume at the same time. Apply mascara in several coats—put focus on the eyes. You shouldn't use mascaras of other colors, even very bright ones—it will still look faded. It makes no sense to list all the great palettes of eye shadows which can be used in the makeup of black eyes. Women with black eyes are the ones who should have the largest set of eye shadows in the dresser! What is more important—their combination with each other. You shouldn't use eye shadows of only one color, whatever it is. Every color has many shades, work with multi-level transitions. Create any color gradations with a transition from dark to light. Makeup on the basis of gray shades, as well as with the use of bright colors, such as purple, lilac, bright blue, and dark green looks very effective. Yellow shadows combined with brown can tune with patches of sunlight! If this makeup is for a special evening out, feel free to use gold, bronze, and any other eye shadows with a pearl effect. Black eyes look great with the most beautiful makeup style, Smoky Eyes. Black eyes need a clear frame. An Arabic style begs clarity and expressiveness. 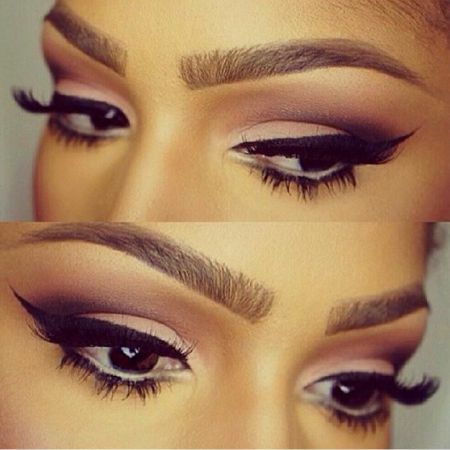 Unlike mascara, eyeliner can not only be black, but dark brown or dark gray. The width and length of the line may vary depending on the time of the day and occasion. A thin line, not reaching the inner corner of the eye, is good for daytime, and evening makeup provides a huge scope for creativity. Despite the fact that the lip line, as well as the line of the eyes, of a dark-eyed girl needs to have a clear outline, the generally accepted rule "the eye or the lips" applies to this case as well. No double standards for oriental beauties! And since it is almost impossible to give a second role to such eyes, we have to restrict the rights of the lips. Sometimes it is possible to afford bright eyes and bright lips, but only when you are under a bright spotlight on the red carpet. So, the lipstick should be of the discreet, quiet shades of the palette, which goes well with the palette of used eye shadows. Face foundation should match the skin tone. As a rule (in this case we are dealing with dark skin) makeup may look more profitable but it is still necessary to use a foundation, because dark skin is not without flaws. Blush should be of warm colors and a matte structure to avoid unnecessary gloss on the cheeks. Like the article «The Basic Rules of Makeup for Black Eyes»? Share it with friends!